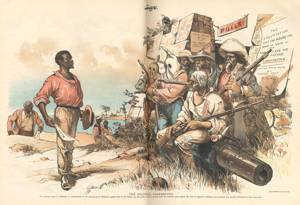 This cartoon reveals the difficulty that Southern black men had in casting their ballots. Because of their race and political affiliation—overwhelmingly Republican—they faced intimidation, violence, and fraud at the polls. Here, black men are surprised and dismayed to find their access to the polls blocked by armed white men of the South—hooded Ku Klux Klan members, former Confederates (one wearing a sheriff’s badge), a “cracker” (slang term for a poor Southern white), and other intimidating figures.